There are more and more boutique shops in Central selling exquisite cakes and fine candies. Despite the high prices, these delicate desserts are still selling like hotcakes and have quite some loyal fans in the town. Sevva is famous for their arrays of colorful and haute cakes, and their founder Bonnie Gokson extends such style to her first standalone cake shop, Ms B's Cakery. Last year I had a birthday cake from Sevva, and this year in 2012 I was delighted to have this, the Rainbow Connection. The rainbow of this cake is hidden inside. 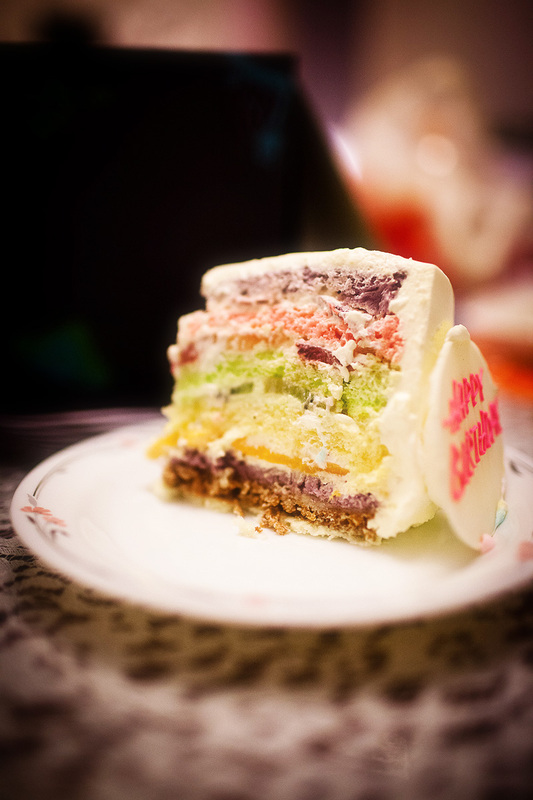 Slicing through the cake and you will see the beautiful seven layers of colors. Each layer represents one different flavour of fruit, and each has real fruit too! For example, the yellow layer is formed by one mango-flavoured cake layer with a sliced mango layer below it. You can imagine over 10 layers are combined to create this cake! It is definitely more than an array of colors, but also an array of tastes! I am surprised that the gorgeous cake is not overly sweet even with the big mixture of flavours. If you have any medical issue which prevents you from sugar intake, you can choose gluten-free cakes from Ms B's Cakery. From here, you will realize that eating cakes is not just a tasting action, but also a visual pleasure, and a kind of style.